I went back to Korea last weekend to visit my friend Christabel again before it got too cold. 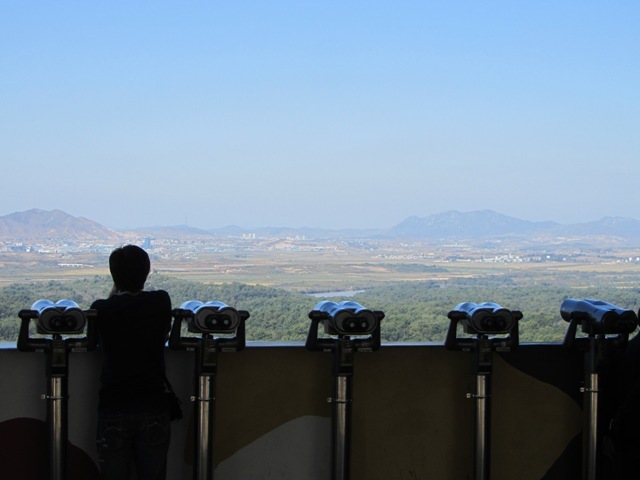 There was only one thing left on my to-do list for Korea and that was to visit the DMZ. Christabel hadn’t been there before either so I booked a tour a few weeks in advance. There are many tour companies and itineraries to choose from. 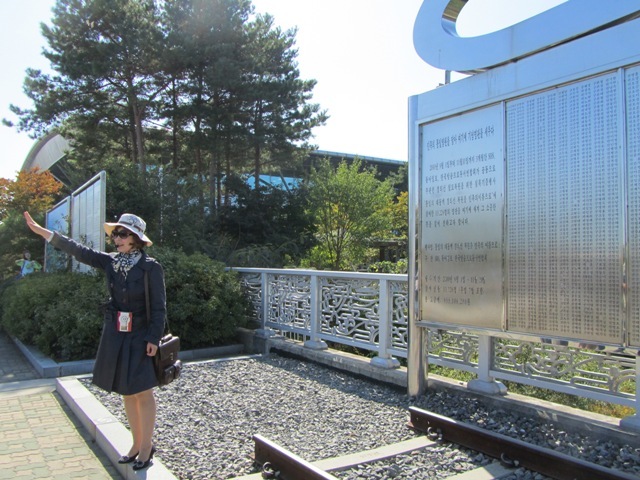 The Koridoor tour run by the USO is the most popular tour and that was booked up well in advance so I went with Tour DMZ, but there seem to be many other tour operators also. The most important thing to know when you’re booking a tour is what exactly you want to see. 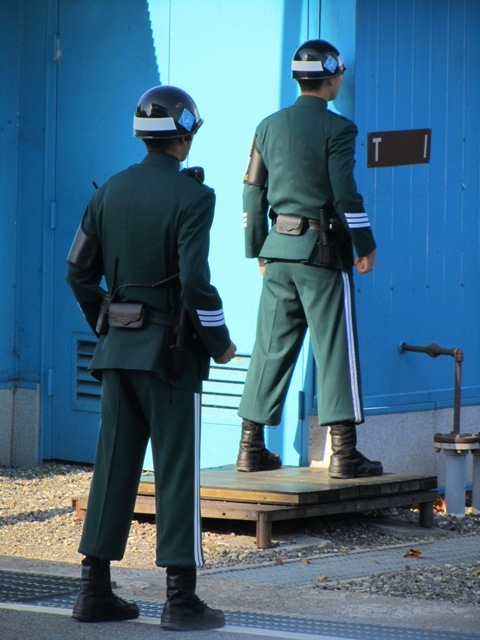 Some tours don’t go to the Joint Security Area in Panmunjeom which is where you can step over to North Korea. Some tours require you to book at least three days in advance with a copy of your passport. 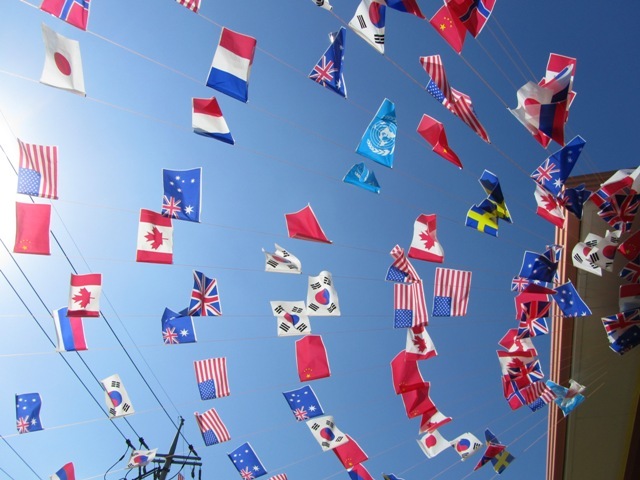 With Tour DMZ I think you can book up until the day before, as long as there is still space on the tour, and just give your passport number. 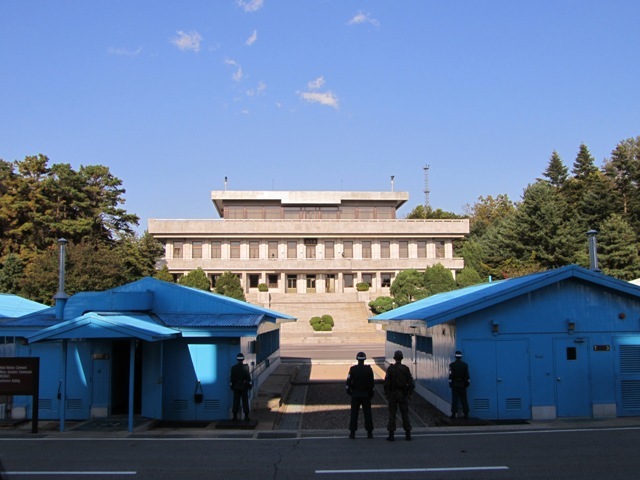 I booked the joint DMZ and Panmunjeom tour which would let us see the sites around the Demilitarized Zone such as the Third Tunnel, Dorasan Train Station and the Dora Observatory, and finishing up with a visit to the Joint Security Area. We had to get up early to be at the Lotte Hotel near City Hall by 8:00, and our bus departed at 8:30. We were on the English tour bus and there was another Japanese bus heading off at the same time, but there seemed to be many buses from other tour companies going to the DMZ. In fact, many of the places we visited were very busy and tourist-oriented. 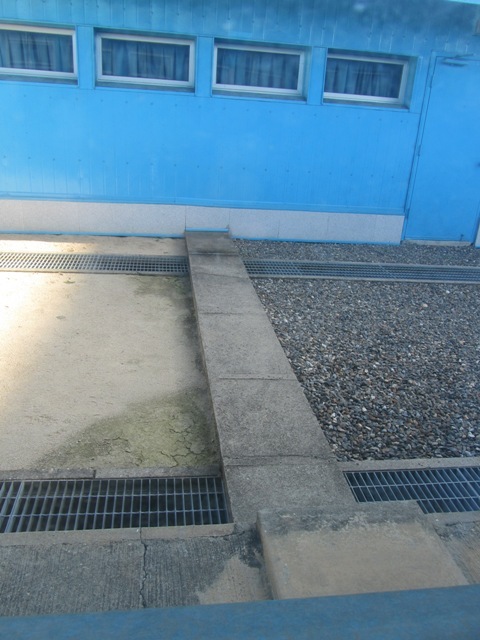 It took about an hour to the Civilian Control Line which acts as a buffer zone to the DMZ. As we drove, our guide told us about the history of the war and the current situation. We were driving alongside the Han River that flows through Seoul and then out to sea. Our guide pointed out that from a short distance outside Seoul, the river is fenced off from the public and has guard posts placed along the fence. This is because the Han River links up with the Imjin River that flows from North Korea. At one point from the road it is possible to see North Korea which is recognizable from the ‘bald mountain’, because North Korea had to cut down the trees for firewood. However, the bottom of the mountain, on the river bank, is wooded to hide weapons there. Three weeks prior to my visit a South Korean man had been shot trying to swim across the Imjin River to the North in broad daylight, despite repeated warnings by the ROK soldiers. This river also caused a lot of trouble in 2009 when North Korea released a large amount of water from the Hwanggang Dam without warning, resulting in the death of six people in the South. Our guide said that when relations are good between the two countries, North Korea will give warning so that the river area can be evacuated. Our first stop was Imjingak, where Freedom Bridge is. This was the first of three bridges we came across on our tour, where prisoners of war were exchanged after the Korean War. We were surprised by the jovial atmosphere of the village as there was a huge group of cyclists getting ready to set off on a bike tour of the DMZ, and their send-off was complete with speakers, music and flares, which made us a bit nervous. We were still below the Civilian Control Line so I assume their bicycle tour was of the buffer zone up until the start of the DMZ. 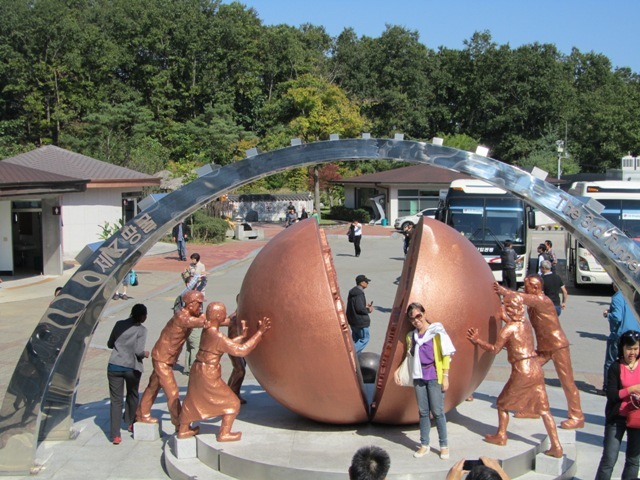 This is a popular visiting spot for Koreans because it’s the last village you can enter without a passport check and it has become a place to remember people’s ancestors who are buried in the north. 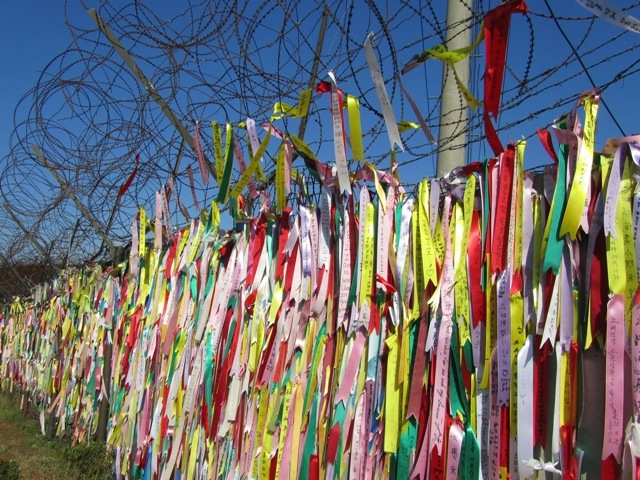 People write messages on ribbons and tie them to the barbed wire fences around the bridge. We had our passports checked at Unification Bridge, just before we entered the DMZ. The bridge crosses the Imjin River and is the route taken by South Koreans who work at the Kaesong Industrial Complex in North Korea. This complex was opened in 2002 as part of the Sunshine Policy, encouraging cooperation between the two Koreas. This allows South Korea access to cheap labour and gives North Korea much needed foreign currency. About 53,000 North Koreans and 800 South Koreans are employed there. Our guide told us that South Korea pays about $100 per North Korean worker per month to the DPRK government, and each worker might get about $30 of that money. The Kaesong Industrial Complex, and other ventures which fund North Korea are controversial, but our guide did have a cute story about inter-Korean relations based on chocolate. A South Korean worker gave one of the North Koreans a Choco Pie (a South Korean cake/biscuit) that he had brought with him to work that day, and the North Korean liked it so much that the company decided to give all of their North Korean employees Choco Pies (I bet they got the idea from Park Chan-Wook’s 2000 film Joint Security Area). When I was in Korea in May, North Korea had removed all of its workers from the complex after escalating tension with South Korea and the US. Since September, the facilities have been running again, but to a limited degree. We visited the Third Tunnel, one of four that have been found, running under the border. Many more may have been built and North Korea denies responsibility for them, despite evidence to the contrary. 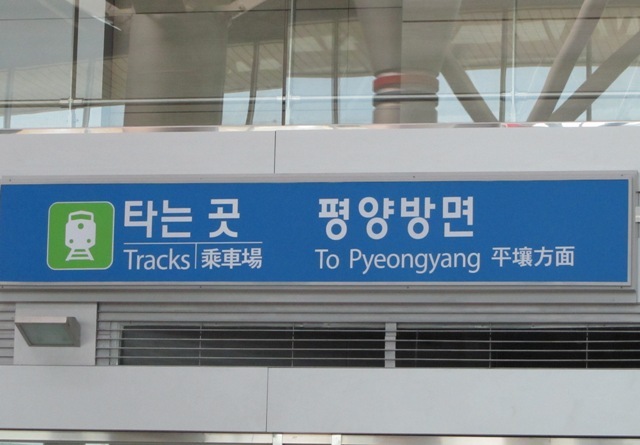 The Third Tunnel comes the closest to Seoul, ending only 44 km away, and it was discovered in 1978 due to information given by a North Korean defector. North Korea tried to explain it as an old coal mine shaft, and indeed the walls had been covered with soot as evidence to their story. However, the tunnel is built through granite bedrock, far from any coal deposits, and there are marks where dynamite was placed, showing that it had been excavated from the North. The place was full of busloads of tourists, waiting to go down into the tunnel. We watched a video about the tunnels and wandered around a small exhibition before collecting our hardhats and getting in a monorail to take us 73 m below ground to the tunnel. It’s possible to walk down there too, but our guide said it was a long walk. We weren’t allowed to take pictures in the tunnel, but I think that was mainly for crowd control, because there were a lot of people down there and stopping to take a picture of the dynamite holes would have held up the queue. The tunnel was quite low, also due to the metal reinforcement scaffolding the South had put in, so everyone over 5’4″ had to stoop. A tall man in front of me was having some trouble so at regular intervals I could hear the clang of his hardhat against the metal pipes. We walked a couple of hundred meters to the first of three barricades and then went back to the monorail. 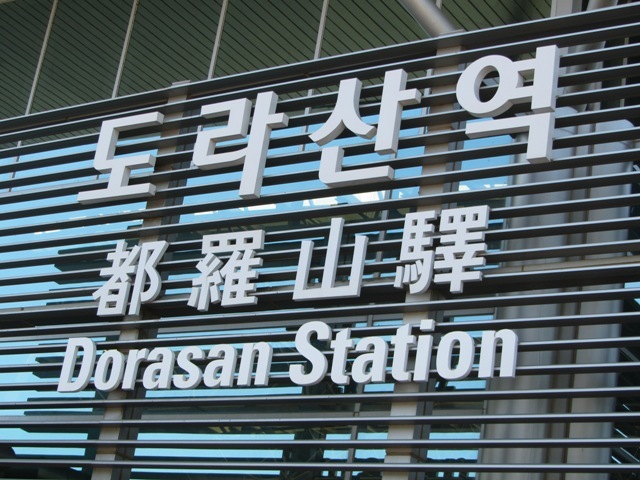 Dorasan Station was built in 2002 with the hopes of linking South Korea by rail to North Korea and to Asia and Europe. 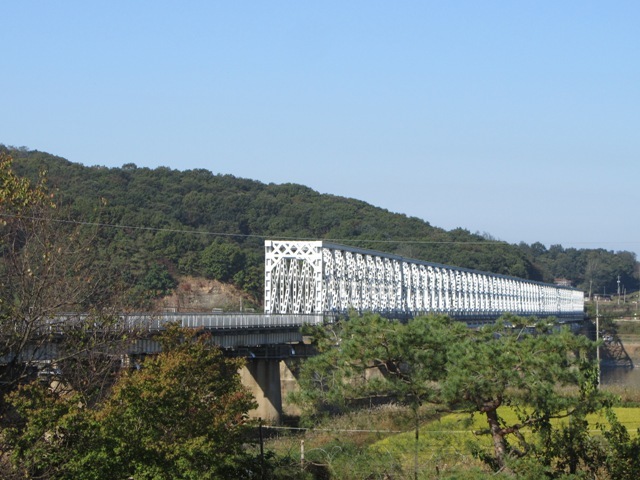 In 2007 it was used to transport freight to and from Kaesong Industrial Complex, but this was ended a year later with the end of the Sunshine Policy. The Dora Observatory was actually the second place we visited, after Imjingak. It gave us our first proper view of North Korea. Across the invisible demarcation line, we could see the Kaesong Industrial Complex and the road leading to it, Kijong-dong (or ‘Propaganda village’) and the huge DPRK flagpole. All the places we visited in the morning were part of the DMZ tour. 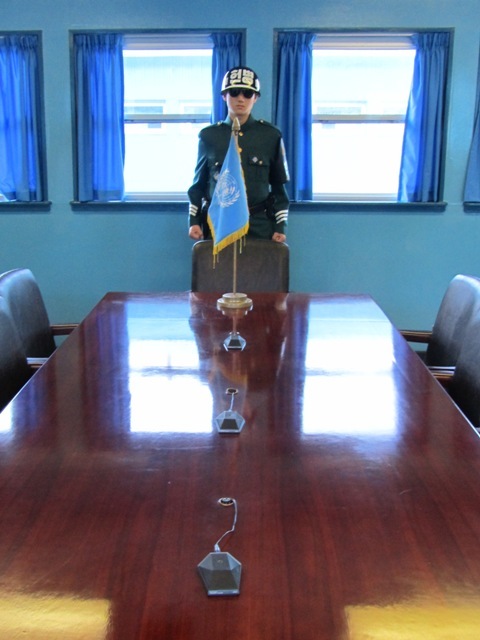 We had a lunch of bulgogi and then we went on the second part of our tour, to the Joint Security Area. We drove to Camp Bonifas, where we had our passports checked, signed a waiver (“like for bungee jumping” said our guide) and listened to a presentation about the history of the JSA. After that we were transferred to an army bus driven by a ROK soldier and accompanied by a US soldier. The visit itself was quite short. We walked through Freedom House and into the Conference Room in the blue building on the left. There were ROK soldiers standing in Taekwondo poses while we were there, and we were relieved to find out that they only have to stand like that when there are visitors, because they looked very tense. This is the conference table where talks between the two sides can take place. It is directly over the demarcation line. 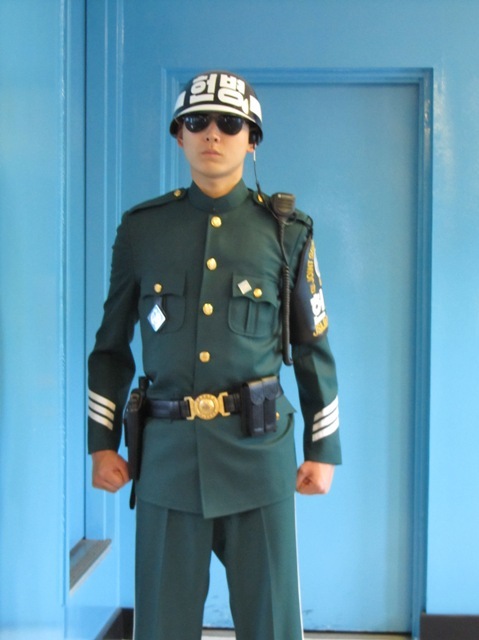 The door behind this soldier leads to North Korea. Our guide warned us that if we tried to walk behind him, he would use his Taekwondo reflexes to stop us. This is the line separating the two sides. I took it while standing on the North Korean side. 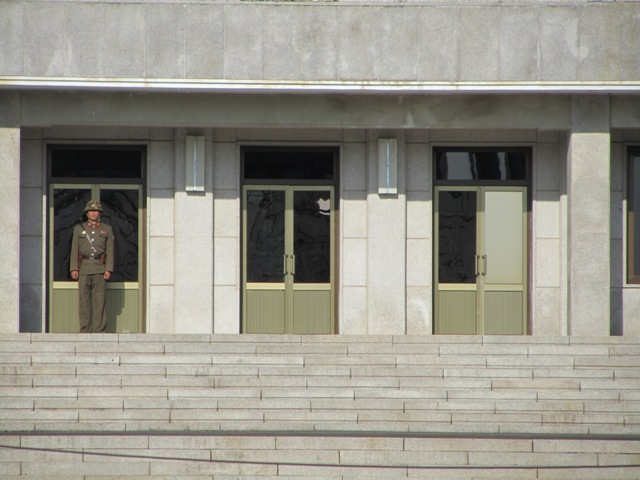 There weren’t any corresponding North Korean soldiers standing across from the South Korean ones. Our guide told us that they only stand there when there are tourists on the North Korean side, or when they know that there are important people visiting from the South. 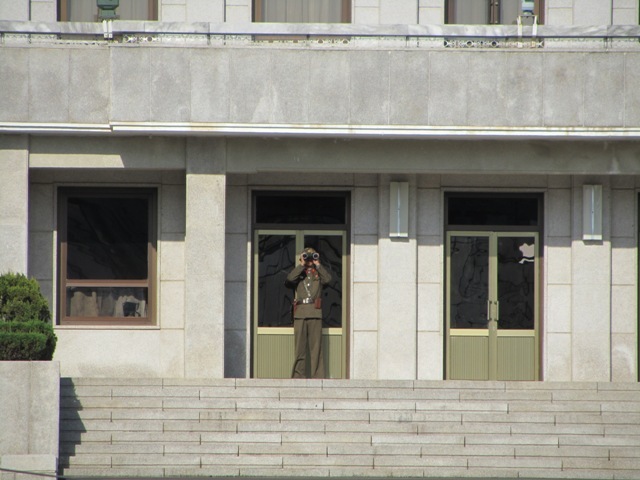 When we arrived however, a soldier did come out and was watching us through binoculars. * Please excuse me if I’ve made any historical or political information mistakes, as I’ve been using my memory and what I could check on Wikipedia to write this.